Yevgeny Ivanovich Zamyatin (Russian: Евге́ний Ива́нович Замя́тин; IPA: [jɪvˈɡʲenʲɪj ɪˈvanəvʲɪtɕ zɐˈmʲætʲɪn]; January 20 (Julian) / February 1 (Gregorian), 1884 – March 10, 1937) was a Russian author of science fictionand political satire. He is most famous for his 1921 novel We, a story set in a dystopian future police state. Despite having been a prominent Old Bolshevik, Zamyatin was deeply disturbed by the policies pursued by theCPSU following the October Revolution. In 1921, We became the first work banned by the Soviet censorship board. Ultimately, Zamyatin arranged for We to be smuggled to the West for publication. The subsequent outrage this sparked within the Party and the Union of Soviet Writers led directly to Zamyatin's successful request for exile from his homeland. 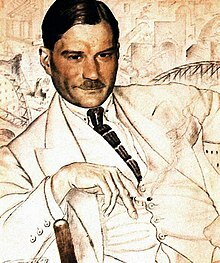 Due to his use of literature to criticize Soviet society, Zamyatin has been referred to as one of the first Soviet dissidents.